Are You Leading the Healthiest Wealthiest Life Possible? Is your Financial Health in order? True wealth is comprised of three “currencies”… financial, time and physical energy, all wound into a glowing braid that forms a strong spine for the body of your life. This is your personal wealth equation. The Making Wealthy Choices Program helps you strengthen each strand so you are empowered to lead your wealthiest, most fulfilling life possible. Financial expert Kirsten Marion and clinical hypnotherapist and yogini Cathy Mines lead you step-by-step toward maximizing your Personal Wealth Equation. 7 modules of audio lessons guiding your through the program step by step. Meditations and Hypnosis tracks to integrate each module. A 35 page companion workbook. 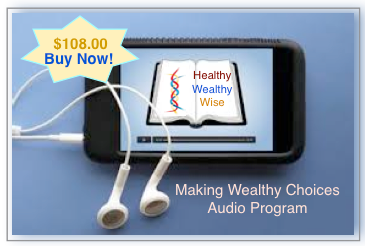 The MAKING WEALTHY CHOICES™ modules are designed to take it one week at a time for integration and ease. This will launch you into your powerful journey. Week 1: Choose Your Tribe Wisely. In the first week you create your personal vision for a wealthy life and learn how to shake the limiting beliefs that have held back your efforts to change. Week 2: Call Your Money Home. There is an economic theory that says if you take the five people that you spend the most time with and average their incomes the number will be pretty close to your income. Here you take a hard look at who you are surrounding yourself with and take back your financial power! Know where you stand financially and start setting your financial goals. Week 3: Build Your Personal Power Base. Physical Energy = Physical Wealth. You re-create your life as a full sensory experience. Week 4: Change Your Heart-Set. Time is our scarcest resource so we learn how to get more out of it. Week 5: It’s My Decision. How does your brain really work when you’re making a financial decision? In this module you learn about the role of dopamine and some pitfalls to avoid when making the choices that create your life experiences. Multi-tasking is so ’80′s. Learn exactly how to make the quantum leaps that will bring your passion back into your life and start living successfully now. The more you have, the more you can give back. Learn why impact investing is so important. You’ve come a long way in the past six weeks bringing your wealthy life into form. Now you get to have a discussion with your Future Self to see what’s in store for you next. You can listen to each module and do the workbook at your convenience. Making Wealthy Choices™ Helps You! Make a Wealthy Choice Now! Shatter negative emotions and limiting beliefs about wealth. Surround yourself with a strong supportive team. Design your personal financial blueprint. Boost your physical energy maximizing your lifetime earning potential. Master time to gain performance, productivity and leisure. Cultivate focus to take a quantum leap to success. You can start today Making YOUR Wealthy Choices with our 7 Module easy to follow Step by step program designed to illuminate your Wealthy Life!